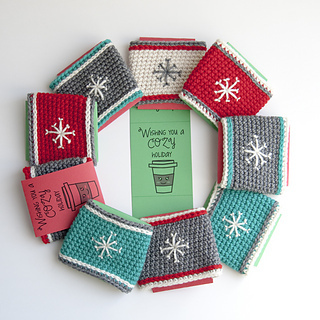 This simple coffee sleeve can be dressed up or down as you like and works up in a snap. It’s perfect for teacher gifts, the letter carrier - even your hair stylist. 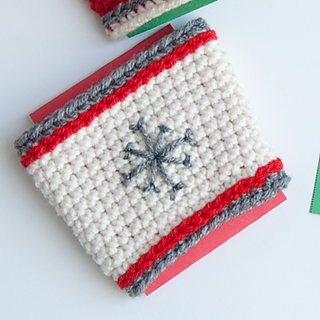 It also comes with a free printable tag that you can use to personalize your gift. 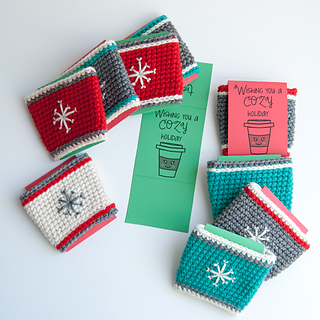 I like to tuck a gift card in behind the tag so my recipients can get started on their coffee drinking right away! Optional top stitching done in surface slip stitch. This pattern uses a size G crochet hook and worsted weight yarn. Exact yarn color requirements are detailed in the pattern.